Jarmo Nykanen was staying at a lakeside summer cottage in Suonenjoki, Finland when he awoke to a buzzing sound in the early morning hours. The cottage was being bathed in a strong blue light. Going outside, Jarmo saw a blue light "twice as big as a row boat" approach from over the lake. It stopped and hovered offshore. The light seemed to radiate from a kind of "jelly," glowing in an unusual manner. Jarmo thought he could see a strange being inside the light. The next thing he remembered he was lying on the porch of his cottage at about 6:00 a.m. He had lost track of four hours of time. 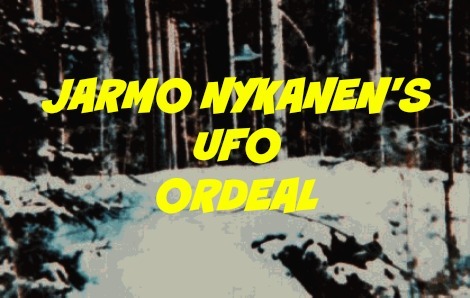 UFO Research of Finland has, after extensive research work, classified the case as a UFO case and declared Mr. Nykanen a reliable witness. Mr. Reijo Kolehmainen, aged 28, is the secondary witness. He has not personally seen the UFOs, but three of the four landing trace areas were found around his home. The following report is based on interviews and other documents accumulated by the research organization. Jarmo woke up at about 10 a.m. and started planning a visit to his summer cottage. In the afternoon he had a sauna bath. Then he walked through the forest to his cottage which is located on a lakeshore. Soon after the arrival he lit a fire outdoors. He warmed up some coffee and ate a bit. In the evening he listened to the radio and went to sleep two hours after midnight. A few moments later he woke up and heard a buzzing sound. First he thought he had forgotten to turn off the radio but soon noticed that this was not the case. Then he saw a strong blue light enter the cottage from the direction of the door. Jarmo went out and walked down to the row-boat jetty. Above the lake he saw a blue light. Suddenly the light started to approach him. It stopped above the shallow water. Now Jarmo realized how huge the light was. It was twice as big as a row-boat. The light seemed to radiate from a jelly of some sort and it glowed in an unusual way. Jarmo thinks he saw a strange being inside the light. And the next thing he remembers is that he found himself lying on the porch of the cottage. The time was 6 a.m. Jarmo went back to bed and slept til noon. The encounter had made him extremely sleepy. The unusual events started again in June, 1975. Jarmo Nykanen heard strange knocking sounds at night. It happened three times at two-month intervals. However, nothing was seen on those occasions. 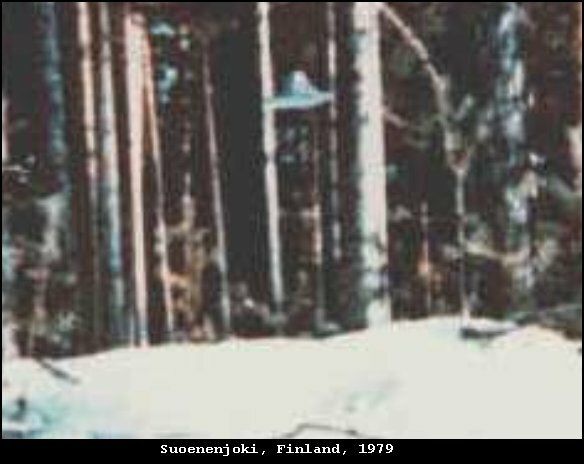 Three landing trace areas were found around Mr. Reijo Kolehmainen's home in February, 1979. At 6:50 a.m. on February 2, 1979 a 2.5 meter crater was found in the snow at a distance of 5 meters from the house. The snow had melted all the way to the ground in the center of the crater. Strange red liquid, pieces of metal,and later a metallic cup were found within the crater. The red liquid smelled of vinegar. At 8:00 a.m. the police came. They photographed the area and took some samples. Late in the evening of February 5, 1979 the Kolehmainen family heard a shooting sound. One constable later revealed he had seen a strange light phenomenon at the same time. On the following morning a bigger crater was found in the snow at a distance of 10 meters from the house. Similar things were again found. Later the police came to have a new look at the area. The police suggested that perhaps somenone had thrown a home-made bomb in the Kolehmainen yard. However, the Kolehmainens stated that nobody has any reason to throw bombs at them. On the morning of February 21, 1979 a third landing trace area was found. This time there were three holes in the yard. Red liquid and pieces of metal were once again found in the landing trace. However, no metallic cup was found this time. There was no snow on the electric wires above the holes, but there was lots of snow on similar wires elsewhere. The Kolehmainens didn't want any publicity, but the news leaked to the press from acquaintances. About ten articles were published by the press about the events. On March 8, 1979 Reijo Kolehmainen traveled to Helsinki and asked his friend Jarmo Nykanen to guard the house. In the evening on March 10, 1979 Jarmo started to make rounds around the house. Suddenly he saw a flash of light in the forest and he thought someone was watching him. Soon after midnight a bell-shaped mini-UFO appeared near the house. The UFO had a diameter of half a meter. The upper part of the UFO radiated blue light and the lower part radiated red light. First he thought he was watching the lights of a car, but then he realized he had encountered a UFO. Jarmo had> a camera with him and he had a couple of shots at the phenomenon. However, the flash didn't work. Jarmo walked closer to the UFO and flashed his torch toward the UFO. Now the UFO ascended to an altitude of three meters and made the whole snow-covered area look red. Then the UFO disappeared into the sky. Later he found out that the photos didn't come out. A few days later Jarmo Nykanen made a map of the Kolehmainen house and its surroundings. He realized that the three landing trace areas formed a triangle. And he noticed that if you prolong one side of the triangle it leads you to the cottage. On March 16, 1979 at around noon he walked to the cottage through the forest. He took binoculars, a camera, and some snacks with him. He arrived at the cottage after 80 minutes. Then he ate his snacks and walked around the cottage. Suddenly Jarmo heard a humming sound obliquely from behind. He turned around. At an altitude of about two meters he saw a bell-shaped mini-UFO. 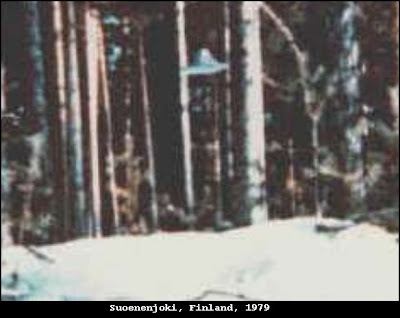 It seemed to be similar to the one he had seen near the Kolehmainen house. Now he started taking photos of the UFO. It radiated blue light and moved forward descending and ascending. After having taken five photos he started walking toward the UFO. Then the UFO disappeared. Jarmo continued to research the area. After about half an hour he was walking on the frozen lake. Now he heard a humming sound from the shore and saw the same UFO in the bushes. Again he walked closer to the UFO and kept taking more photos. Then he climbed up the cliff. He tried to sneak to the other side of the encounter area. However, on his way he stumbled and inadvertently took a shot of the trees with the camera. Now the UFO directed a red beam of light toward Jarmo's face. The light was so bright that it blinded him for a while. Jarmo hid himself behind a fir tree. Now he took his last photo, the twelfth. After a while the UFO flew a bit further away from Jarmo. Suddenly there was a flash of light on top of it. Red smoke puffed out of the UFO and a cylinder-shaped object zoomed to the sky. Pieces of metal and some red liquid were left on the ground. Now Jarmo got extremely tired and sleepy. He only took a quick look at the red spot and left for home. When he reached the road (this time he didn't take the short-cut through the forest) he met Reijo Kolehmainen. Reijo was on his way to the gas station. Reijo noticed that there was blood on top of Jarmo's nose as well as two tiny holes. However, the holes disappeared later. The weather was fairly good. The sun was shining behind a thin cloud cover and the temperature was a few degrees below freezing. Jarmo told his story to Reijo later.